A Kiss on the Hand May Be Quite... CARTIER! Recently I had the great privilege of twice viewing a truly exceptional exhibit of the most extraordinary and rarified objects, moreover objects superbly displayed and exquisitely lit, and housed in what is arguably one of the most beautiful small museums in the world. However, in spite of my great delight at having spent over seven hours indulging my eye, I both times came away with what I can only describe as a nagging sense of disappointment over missed opportunities to give a deeper “context” to the very amazing pieces on exhibit. The thing that puzzled (and yes, bothered me) was that the exhibit notes provided relatively little background for the jewels. 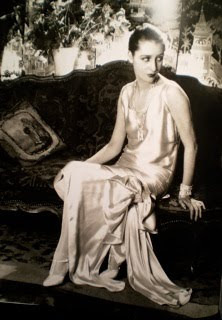 Each item had a little descriptive tag next to it, but these tags were only “thumb-nails”; the major Cartier stylistic changes were synopsized (the 18th century revival so beloved by the Edwardian's, the Art Deco jewels, the Russian-style pieces inspired by the fashion for Fabergé, etc. 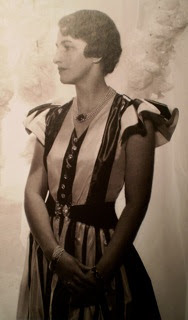 ); and a few of the famous women who had commissioned or owned the pieces (like the Duchess of Windsor) were given slightly more in-depth profiles. Mind you, I wouldn’t have thought that Wallace Windsor would have needed an explanation, any more than Coco Chanel does (although I am told otherwise). However, who (for instance) was this Daisy Fellows, who owned so many of these spectacular jewels? 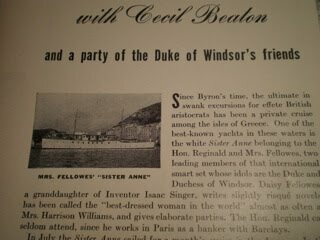 Actually, the audio tour does flesh out some of the details (for instance, we learn that Daisy Fellows was the Singer Sewing Machine heiress). 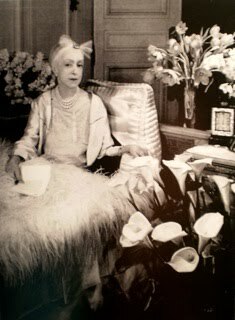 For me, the highlight of the audio tour were the comments by San Franciscan Dede Wilsey, who is herself a wealthy socialite and philanthropist in the tradition of Marjorie Merriweather Post. (Indeed, she tells a delightful story about meeting Post as a little girl, when the former was a guest of her parents. Post asked little Dede if she would like to try on her diamond and emerald necklace; and then, since she was wearing one of those great 1950s dresses with a wide, bouffant skirt, asked the little girl if she would like to see her twirl!) Not only a charming story, but it spoke volumes about Mrs. Post, and suggested the delight she must have taken in both her own good fortune, and with sharing it. Thus, it gave her collecting exactly the sort of context that I wished there had been more of! In the exhibit, next to a charming little miniature temple rendered in calibré- and baguette-cut diamonds, we read that there is a picture of de Wolfe wearing a similar model on her cloche hat. We in the decorating world probably know at least something about Elsie, but she is hardly the household word she was at the height of her fame. Once upon a time, she was THE most famous decorator in the World, a great figure in society, known for her wit, her “poils”, and the enormously high prices she charged for her services. She practically invented the way interior decorating is practiced to this day, and her innovative mix of antiques and modern comfort still resonates more than a hundred years later. On the subject of hat ornaments: in books, these Cartier pieces are often described as “Jabot ornaments” and tho they may have done double duty as such, their primary role was to ornament the head-hugging cloche hats that were such a hall-mark of the 1920s. In the exhibit, they are referred to as “Cliquet Pins” (“cliquet” being French for “catch”), but how interesting it would have been to know that in the 1920s women did indeed pin these through their hats! Don’t get me wrong--for all my exceptions the exhibit was unquestionably spectacular, the jewels & objects exquisitely lit and superbly mounted on silk covered presentation boards which were both imaginative and elegant in their own right. However, it did seem as tho there were many good opportunities for increasing the intimacy of the viewing experience thrown to the wind, of which these examples are but a few. But perhaps everyone who attended the exhibit knew these plummy little details, and I’m just a lone voice crying in the wind? Obviously, I’m firmly convinced that helping people understand what they are looking at invariably makes for a richer viewing experience. 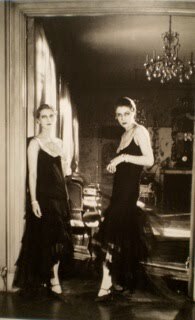 Inspecting the beautiful and almost chaste powder, lipstick, and cigarette case that had been given to Chanel by the Duke of Westminster, one could oneself surmise at the origins of her own taste for simplicity. (Tho famously independent, she was also famously influenced by each of her lovers, creating little sailor suits inspired by the yachts and sports-wear inspired by the polo-players.) But sadly, no mention at all was made of the punning inscription on the gold interior of the case, which reads “Amour Ben d’or/24" (or: “Love Ben of Gold/24”, Bendor being her paramour’s pet name.) What a charming lover he must have been, too, and what fun it would have been to have the severe Mademoiselle made a little more human and captivating! Increasingly over the last 40 years, Museum-going seems to have become a form of popular entertainment, but I sometimes feel as though the text accompanying the exhibitions is being unnecessarily simplified. Perhaps it is merely that curators now choose to write the descriptions to best suit that part of their audience that no longer reads much and has short attention spans. However, with the demise of the soft-cover, carry away leaflet and the advent of the expensive catalog, I think viewers are being cheated out of part of the viewing experience. The deeper purpose of Museums is to educate people, to deepen their appreciation for art, and to give them a greater understanding for the world and (often) for the past: all things which serve as a civilizing influence. The desire to create is innate to the human experience, and is one of the things that links us to our human past, generation upon generation, out of recorded time to our very earliest ancestors. Along with many of the great visionary collectors whose endowments have created and enriched the great museums, all educated people must concur that exposure to art in all its forms, and to the amazing creative potential human beings posses, is a vital and important (and singularly enriching) activity. The Marjorie Merriweather Post’s and the Dede Wilsey’s and the Mr. and Mrs. H.O. Havermeyer’s and the Dominique de Menil’s of this world understood that sharing their treasures & the fruits of their highly cultivated sensibilities, and using their often enormous wealth and privilege to benefit the community, has a spiritual aspect to it. (Not for nothing have museums sometimes been called the modern cathedrals.) After all, one has to believe in something, and it’s awfully hard to base your spirituality on the behavior of stockbrokers or politicians. In my own community there has been a recent outcry about funding for Child Protective Services being cut drastically while the local museum was awarded a grant to provide art education “for rich kids”. And while I am not naive enough to suggest that an appreciation of art and culture will cure all of the world’s ills, I do believe that anything that deepens people’s humanity and sense of connection to one-another is good for the community and for the world. What a dilemma to be put in the position of having to choose one over the other. I felt extremely lucky in that I could spend over $100.- driving to the City, twice paying a $20.- museum entry fee, then renting an audio tour and purchasing a $30.- exhibition catalog; but I was struck by how many people cannot do this, and by the fact that today, museum-going is far from an egalitarian experience. I realize that tickets to sporting events and to the Theater are also often prohibitively expensive; but tho one can watch sports on television, and rent movies for a dollar at a kiosk at the grocery store, there is nothing that replicates the experience of viewing art in the real. ANYWAYS (as I am ungrammatically fond of saying) the CARTIER was a BRILLIANT and incredibly evocative exhibit, showcasing these amazing “baubles” from a vanished age, made for the very, VERY wealthy and privileged. And as is often the case with museum exhibits, it truly was a “dream” show, following me long after I left the museum itself. 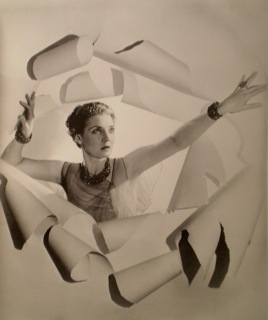 THE GLASS OF FASHION--Cecil Beaton (1952) My personal bible, which I was lucky enough to stumble upon at the age of 11, and which, I believe, set my path for life. THE WANDERING YEARS--Cecil Beaton (1961) An inspiring tale of self-invention by a fascinating and rapier-eyed observer of the beau monde--which I have probably read, always with the greatest delight, at least 40 times. GENTLEMEN PREFER BLONDS--Anita Loos (1926) The ‘diamond-in-cheek’ story of the most infamous gold-digger of all time, which ran to more than 20 editions when first published. GREAT WOMEN COLLECTORS--Charlotte Gere and Mariana Vaizey (1999) Effortless feminism, linked to impeccable scholarship. NANCY LANCASTER--Martin Fuller (1996) The most fascinating combination of biography and auto-biography. Lancaster tells her own story in bold-face and Fuller fleshes out the tale in regular type. 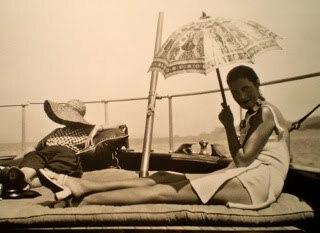 ELSIE DE WOLFE (“A Life in High Style”)--Jane Smith (1982) One of the two best biographies I have EVER read, both of course written by women.